In doing so, my mother perhaps took this reverence thing a little too far. She stressed to me to never place other over books physically on top of any Bible. For example, if I were carrying a pile of books or resting them on a table, and a Bible was one of them, then God’s Word needed to always on top and out in front. To do otherwise was to show great disrespect. As you may guess, this practice could be a nit unwieldy if one of the Bibles in question was huge study Bible or a humongous family-sized coffee table version of sacred Scripture, and the other tomes in question were much smaller paperbacks. This would be especially true since both gravity and the design of the human arm attempting to hold said group of books could often come into play! My mom also discouraged marking up the inside of a Bible (with the possible exception of the front dedication page where you write the “to” and “from” fields if it was a gift). This means no underlining, highlighting or writing notes in the margins. The elevated level of awe and respect that ancient Jewish teachers and scribes had for Torah and the other Scriptures, along with the methods used for making copies, brings new meaning to the word “meticulous.” To them, the books that now comprise what is known as the Old Testament, was unquestionably holy and sacred as God’s written Word and not to be taken lightly. First, the scribes could only use pristine animal skins, both to write on, and even to bind manuscripts. The ink used to write had to be black, and of a special recipe. Each column of writing could have no less than 48, and no more than 60 lines. The scribes had to verbalize each word aloud while they were writing. They had to wipe the pen and wash their entire bodies before writing the word “YHWH,” [the name of God, which is the Hebrew equivalent of “I AM,” as revealed to Moses at the burning bush in Exodus 3] every time they wrote it. There had to be a peer review done within thirty days, and if as many as three pages required corrections, the entire manuscript had to be redone. Not only was this hyper-careful process a showcase of how esteemed they thought Scripture was, but it also quells any critical objection that “how do we know the Bible wasn’t changed or modified throughout the centuries?” as it clearly shows that what we have now as Scripture was precisely what people read over 2,000 years ago, securing near-perfect accuracy and preservation of what was said in the original texts. Not only this, but that assertion can be backed up by comparing ancient copies of the Old Testament found from various historical periods. Now, this reverence for God’s Word is absolutely commendable. Yet while this veneration for what is said in Scripture is something we should all aspire to have, this very easily can cross the line into some unsavory territory: legalism. Keep that thought simmering on the back burner of your mind, as we’ll talk more about that subject in a few minutes. Next, let’s get a brief understanding of how what is now known as the Bible has been passed down over the centuries. We attribute the first five books of the Old Testament (AKA the Torah or “Pentateuch”) to have been written by Moses somewhere around circa 1,500 BC. 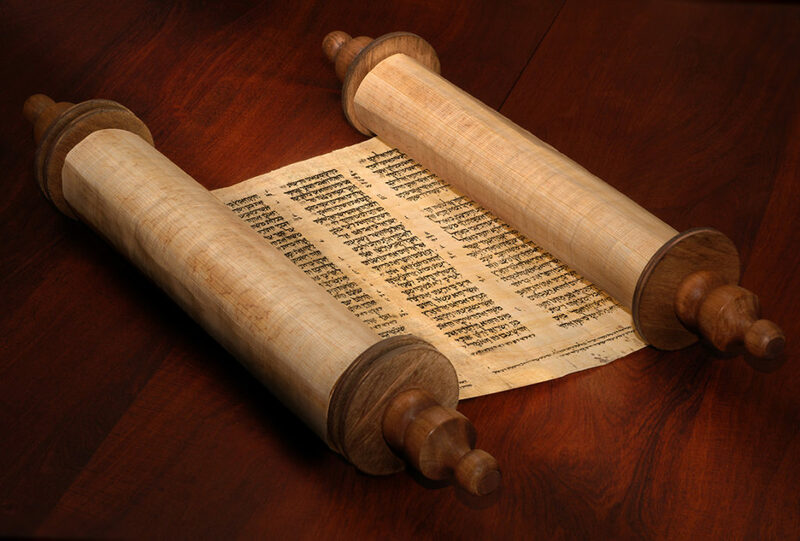 We don’t have copies dating back that far (such as the one placed in the Ark of the Covenant by the Levites under command of Moses in Deuteronomy 31:24-26), but ancient writings from that time period were put down on scrolls consisting of either leather parchment (cleaned animal skins, as mentioned above, that had been scraped, burnished, and stitched together) or papyrus (a plant-based paper). It probably wasn’t until the 5th or 6th centuries BC, around the time of the Jews’ return from the Babylonian Exile, that under the direction of Ezra the Prophet that effort was put in towards re-collecting and inscribing parts of the Old Testament that had been written up to that point (the Pentateuch, the early historical books like Joshua, the earlier prophets, and some of the Psalms and Proverbs). A copy of this first “proto-Bible” was then stored in the Ark constructed for the second temple, and, following the aforementioned meticulous process of duplication, other copies were made to preserve the inspired writings. Still, what was used to train Israelites back in those days were public readings of Scripture and oral traditions. While scroll copies of the Scriptures were kept at sacred places like synagogues, virtually no Jews had full copies of God’s Word at home. Because of this, any physical copies of God’s Word were highly revered. The codex (a book-like format consisting of sheets of papyrus sewn together and placed between two pieces of wood for covers) was developed in around the 1st or 2nd centuries AD; and then around 320 AD, the converted Christian Roman Emperor Constantine ordered copying of the Bible (which by that time contained the books of the New Testament) and allowed for proliferation and distribution of God’s Word throughout the Roman Empire. Gutenberg’s printing press over a thousand years later in 1455, paving the way for technology finally allowing mass duplication of the Bible. This gave most people in Europe the opportunity to own a copy of Holy Scripture in their home for personal use, although because of early costs and distribution channels, it took a few centuries for that potential to become a reality. As you can see, for most of Judeo-Christian history, most people did not have a personal copy of Scripture to do with what they want. What is legalism? Dictionary.com defines it as, “strict adherence, or the principle of strict adherence, to law or prescription, especially to the letter rather than the spirit.” As it applies to the Bible, it is when one stringently follows the Law of God as found in the Old Testament (or even an invented set of rules in New Testament times) without letting the Law change their hearts. One can go through the motions and appear “religious,” but inward they can be full of wickedness and sin instead of loving God, loving their neighbors, and letting the grace of God change them. One such group that practiced legalism by the time Jesus arrived on the scene were the Pharisees, a very pious Jewish sect of scribes and sages. Now, to call the Pharisees “villains” would be a bit inaccurate, as the members started off with very good intentions. After all, in countless instances throughout the Old Testament, the Lord demanded exacting standards out of the ancient Israelites when it came to following His Law and commandments, and that’s all the Pharisees were trying to do. Or was it? Somewhere along the way, the Pharisees had gotten sidetracked and let self-righteousness, arrogance and vanity rule their motivations. Jesus’ talk of and scorn of this group is liberally sprinkled all throughout the four Gospels, often using them as a prime example of what what was wrong with man’s interpretation of God’s rules and the human heart. This says a lot. The Pharisees were caught up in the letter of the Law and instead ignored why the Law was put there in the first place. They wanted to be appear holy and squeaky clean and righteous on the outside, but they weren’t concerned about the inside. They cared little about cleaning up their hearts and minds. Rules, regulations, rituals and ceremonies were adhered to, but they forgot to have humility and love, and thought their actions could win favor with God. In summary, this is legalism. And it’s easy to get sucked into having a legalistic attitude about all sorts of religious things. Why? Because the act of legalism is actually a breeze compared to the calling that Jesus places on our lives. It calls for relatively low-maintenance actions in our lives, such as showing up at church every Sunday, going through the ceremonial motions, peppering your prayers with lofty, religious-sounding words like “thee” and “thou art,” and outwardly snubbing your nose at the sinful actions of others. Jesus calls us into something deeper. Something more substantial. He wants you and I as Christians to take up our crosses daily and follow Him. Our Lord wants us to have the attitude of a sinful tax collector as opposed to the self-righteous Pharisee (read Luke 18:9-14). He wants us to abandon self and draw into Him intimately to drink of the living waters that only He provides. It is through this transformation that we change. We want to draw closer and closer to God, love Him more, and start showing love and grace towards our fellow man. In it, we will gain a new, holy perspective about God; we will start to move away from what the old, selfish heart desired and long for what God wants instead. So, How Does This Apply to Written Scripture? Ah, so after that lengthy little detour, we’re finally coming around to the topic of this article. With a changed heart, a longing for Christ constantly in our lives, and a newfound appreciation and reverence for God, we will want to long for every Word of God. While prior to accepting Jesus into our lives, we might have seen the Bible as foolishness; nowadays, it’s nourishment for our very souls. We will see the very Words of the Creator as being holy and exquisite; uplifting and sanctifying; and penetrating and revealing. What about the printed Word (or lowercase “word”, for that matter) on the page? Is there something holy about the ink and paper itself? Short answer, no. It’s what the words on the page and what the represent that should be adored and held high in our hearts. It’s quite alright to “love” our Bibles, but it’s ultimately not the physical product of a modern book publisher that we worship and follow with our very lives; it is the living, infallible, holy Word of God contained within. Scripturally speaking, is there anything in the Old or New Testaments that talk about how we should esteem the written Word itself? Modern believers can apply this to our own lives by writing, printing and posting up Bible verses everywhere to remind us of God’s Words and to let them soak into our hearts and souls. Notice that in that verse it says “…lay up these Words of Mine in your heart…” This is the goal: to take every single utterance of God to heart, let it change us and for us to develop a love for and obedience to God through it. I personally believe that as long as you’re taking all of Scripture to heart and revering the words themselves above all else, it’s quite alright to markup your Bible. I feel you should do whatever it takes to aide and enrich your study time in God’s Word. 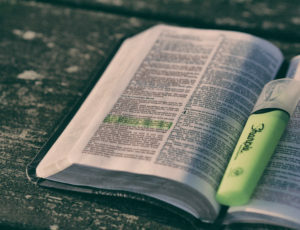 Many people have used techniques such as using different colored highlighters, circling, underlining, and putting notes in the margins are excellent ways of keeping track of what you cover in Scripture. Pray for direction, discernment, and enlightenment from the Holy Spirit. If you’re not doing this already when reading the Bible in general, I suggest that you start doing this now. If you’re taking notes on a particular passage while listening to a sermon, make sure you that the pastor or teacher with whom you’re following along with is firmly rooted in Biblical Christianity. Don’t just write or highlight something on a whim. Prayerfully consider what you do mark up as being only things that are Spirit-led and highly important. Pastor and author J.A. Medders has some additional pointers in his article, 6 Reasons Why You Should Write in Your Bible; go over to that page right now and listen to what he has to say. The point to all of this is, you should develop a deep love for God and His Word. Don’t let yourself get hung up in the details of the physicality of the paper and ink, and do everything you can to help you soak up Scripture. So, go for it! 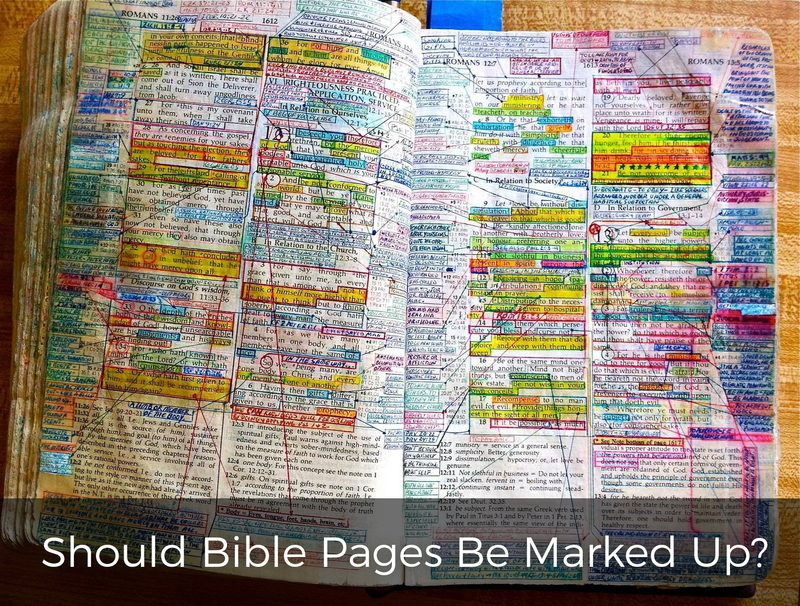 Mark up your Bible, highlight different passages, and let study time prosper through this practice. I had no idea the Old Testament scribes had to go through so much to copy scripture! An eye opener.